It's 00:05 in Saugus, USA right now. Valencia-Santa Clarita View A view of Valencia/Six Flags Magic Mountain/Steveson Ranch areas within Santa Clarita from Saugus, CA. Valencia, California: College of the Canyons, 2.1 miles away. 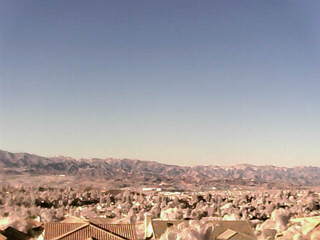 Porter Ranch, California: Weathercam, 9 miles away. Burbank, California: Bob Hope Airport (BUR), 20.8 miles away. La Crescenta, California: San Gabriel Mountains, 21.6 miles away. La Crescenta-Montrose, California: View over La Crescenta-Montrose, 21.7 miles away. Topanga Beach, California: Live Surf Camera, 25.9 miles away. Altadena, California: Altadena WeatherCam, 28 miles away. Santa Monica, California: Santa Monica Beach, 28.1 miles away.